Gas-fired cogen plants are common, but biomass-fueled plants have the added benefit of using a renewable, practically inexhaustible fuel source. According to the International Energy Agency, power generation from non-hydro renewable sources including solar, wind, and bioenergy will exceed gas and nuclear by 2016, and renewable power is expected to increase by 40 percent in the next five years. "Combined heat and power (CHP), also known as cogeneration, is the simultaneous production of electricity and heat from a single fuel source, such as: natural gas, biomass, biogas, coal, waste heat, or oil," EPA reports. Cogeneration was likely first introduced by Thomas Edison in 1882 at his Pearl Street Station, which combined heat and power, producing electricity and thermal energy. While sources such as solar and wind are well-known alternate energy sources, it is estimated that around 8 percent of world electric generation capacity comes from cogeneration power systems. In countries such as Finland (almost 40 percent) and Denmark (more than 50 percent), cogen provides a substantial portion of the national power production. Cogeneration is more a principle rather than a single technology, with the main advantage of CHP plants being optimal efficiency. Conventional power generation discard up to 65 percent of energy potential as waste heat, while cogeneration plants have a conversion efficiency of 75-90 percent and are particularly useful in colder climates where the heat can be used for heating buildings and industrial processes. A further benefit lies in the proximity of the average cogen facility compared to the 5-10 percent loss in transmission of electricity from typically remote traditional power stations. Environmentally friendly, the majority of today's large industrial and commercial CHP applications are in the pulp and paper, chemical, refining, food processing, ethanol, and manufacturing sectors, which require vast amounts of electricity and heat and typically run on natural gas, generally believed to be the cleanest fossil fuel. Because natural gas is in great supply across North America, it is free of geopolitical strife. Cogeneration systems use less fuel to produce the same amount of energy. Cogeneration is an integrated energy system that may be altered, depending upon the needs of the energy user. Gas-fired cogen plants are common, but biomass-fueled plants have the added benefit of using a renewable, practically inexhaustible fuel source. In a pulp mill for instance, wood waste that would typically end up in landfills can be recycled and used as fuel for on-site cogeneration plants to provide power for the pulp mill and for steam for operations. Any additional power can be exported. I believe that cogeneration systems play a crucial role in meeting North American energy needs and reducing the environmental impact of power generation, such as is found with coal. As reported by www.good.is, it takes 876kwh to power a single light bulb continuously for a year, which equates to 714 pounds of coal or 143 pounds for natural gas. Quite simply, cogeneration systems require less fuel than these conventional sources because both heat and fuel are utilized to produce energy, and sources such as biomass waste can be used as a fuel to further lessen the impact on the environment. Because less fuel is burned to produce energy, CHP reduces greenhouse gas emissions. 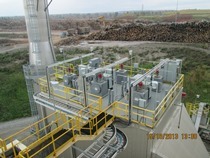 CHP's high efficiency and reliability also result in overall savings for the operations. Our company, Fortress Paper has made a significant investment in cogeneration at our Fortress Specialty Cellulose Mill in Thurso, Quebec, where we have expanded into the renewable energy generation sector with the construction of a cogeneration facility. We are upgrading the on-site cogeneration facility to produce up to 25 megawatts of green energy, and we also entered into an energy supply agreement with Hydro Quebec to provide green power to the grid for a 15-year term. Cogeneration exemplifies a demonstrated, cost-effective, and energy-efficient solution for delivering electricity and heat. As we make a transition to a more sustainable energy future, continued availability of affordable natural gas is crucial. Newer technologies such as fuel cells, with their small-scale applications, also play an important role in cogeneration's future. As more organizations invest in cogeneration, we will likely see a noticeable reduction in peak electrical demand. This benefits utility providers by decreasing infrastructure costs and alleviates upward pressure on electricity costs. As climate change caused by greenhouse gases becomes a growing global issue, the significance of CHP as a real way to reduce emissions is more obvious than ever.